Welcome to the West Carroll Sheriff’s Department. Through this website, we strive to keep the citizens of West Carroll informed. Occasionally, we will post press releases, community events, wanted persons, or requests for assistance. Please check our website often to look for new updates. Browse the staff page and get to know our deputies. Take advantage of our TIPs page by submitting confidential information about crimes in your neighborhood. Links also provide information regarding applications for employment, how to pay fines, and jail visitation. If you have a question that cannot be answered by the information provided on our website, do not hesitate to call our office any time 24/7. On the morning of February 4, 2019, the West Carroll Parish Sheriff’s Department received a request for assistance from the East Carroll Parish Sheriff’s Department who was in pursuit of a red pickup truck and trailer traveling West on LA HWY 2. The suspect had been seen stealing property in Lake Providence. Lake Providence Police Department attempted to initiate a traffic stop, but the suspect fled. The suspect vehicle crossed into West Carroll Parish where deputies and officers with the Oak Grove Police Department joined the pursuit. A roadblock was set up on LA HWY 2 near the Oak Grove city limits. The suspect attempted to drive on the shoulder to avoid the roadblock and slid into a ditch. The driver, Gregory Foster, was apprehended. Several items on the trailer were identified as stolen. Investigators determined that the trailer was stolen from Ouachita Parish. Foster was booked into the West Carroll Parish Jail on numerous charges including aggravated flight from an officer and aggravated assault of a police officer with a motor vehicle. Foster was transferred to East Carroll Parish where he was booked for additional charges. On New Year's Day 2019, at 8:54 pm, the WCSO worked a crash involving a tractor trailer rig. A 2017 Western Star rig was headed south on LA 585 and the driver, a 60 y.o. man from Madera, Ca. lost control in a curve at the intersection of Smith Rd south of Goodwill. The tractor and trailer left the roadway and impacted a ditch causing the rig to overturn. The impact totaled the truck and trailer, and a load of eggs were lost. The driver was ticketed for Careless Operation. The recommended speed for the curve was 20mph. No injuries were reported. On November 25, 2018, the West Carroll Sheriff’s Department responded to a disturbance in the Fiske Union area of the Parish. Accompanied by officers from the Oak Grove Police Department, a deputy recognized Sedonnia Bass sitting in a vehicle in the driveway. Officers knew Bass to be the subject of an active drug-related investigation that resulted in multiple warrants for her arrest. Officers contacted Bass and placed her under arrest. Subsequent to the arrest, Officers found approximately 4.5 ounces of methamphetamine in Bass’s possession. The methamphetamine had a street value of approximately $11,000. Bass was absconding from federal probation at the time of her arrest, and a federal warrant with the US Marshals was served also. Upon learning of Bass’s arrest, Agents with the Drug Enforcement Agency were assigned to the case for federal prosecution. Bass will remain in custody and be adjudicated at the Federal Courthouse in Monroe, LA. On Thursday, November 29, 2018, Sheriff Jerry Philley, Detective Nick Dooley, and K-9 Ghost visited third grade and second grade classes at Oak Grove Elementary. Students were studying a story about a police K-9 and his handler called Ares and Officer Mike. Detective Dooley discussed Ghost’s training, his qualifications, and job with the students. The students had many questions and demonstrated a lot of interest in K-9 Ghost and K-9 Ares. Ghost is a 4 year old Belgian Malinois and German Shepherd mix imported from Slovakia and trained at Alpha K-9 in Jackson, MS. Ghost is trained to find various drugs, track fleeing suspects, conduct building searches, and make apprehensions. Sheriff Philley would like to thank the teachers, students, and Principle Beard for inviting his department to visit Oak Grove Elementary. On Monday, October 29, 2018, Investigators with the West Carroll Parish Sheriff's Department assisted Probation and Parole conduct a home compliance check of Dylan Cason on Herring Street in Oak Grove. While there, Officers found illegal drug paraphernalia, suspected methamphetamine, and suspected synthetic cannabinoids in Dylan's bedroom. Dylan was not present at the time of the search and failed to report to his Probation Officer as required. An arrest warrant for Dylan was requested by Sheriff's Office Investigators and was granted by a 5th District Judge. On Friday, November 2, 2018, Dylan was apprehended in Delhi, LA by Investigators from the Delhi Police Department. At the time of his arrest, Dylan was in possession of suspected cocaine, suspected methamphetamine, suspected synthetic cannabinoids, and drug paraphernalia. Dylan will face drug related charges in both Richland and West Carroll Parishes. Toby Brooks was accompanying Dylan at the time, and Delhi Police discovered that Toby was also wanted in West Carroll for failure to appear related to traffic charges. Toby and Dylan were booked in Richland Parish and transported to the West Carroll Parish Jail. Toby and Dylan are the second and third West Carroll residents arrested by the Delhi Police Department in recent weeks. On October 18, 2018, Investigators apprehended Joshua Price who had active warrants in West Carroll for jumping bail. Price was taken into custody after a brief pursuit and foot chase. At the time of his arrest, Price was found to be in possession of suspected marijuana and suspected methamphetamine. Sheriff Philley commended the officers involved in the cases and noted that the arrests would not have been possible if it were not for the great working relationships the Sheriff's Department has with its surrounding agencies. On the afternoon of October 22, 2018, at 2:05 pm, the West Carroll Sheriff’s Office received a call in reference to a female passed out and laying on her baby. Upon Emergency Medical Services and Deputies’ arrival, a young baby was found lying on the couch unresponsive. EMS personnel checked the young baby for vitals and none were found. EMS requested a coroner to the scene where the infant was pronounced dead. Preliminary investigation revealed that Sciortino was under the influence of drugs and alcohol while she was the sole and primary caretaker of the infant. A search warrant was served where Illegal narcotics and empty liquor bottles were found in the residence. Sciortino admitted to using drugs and alcohol. A blood sample was taken from Sciortino and toxicology results will be determined through the Louisiana State Police Crime Lab. Through further investigation detectives obtained probable cause to arrest Cynthia Marie Sciortino for LA RS 40:967 Possession of Schedule II CDS (2 counts), LA RS 14:93.2.3 Second Degree Cruelty to Juveniles, and LA RS 14:30.1 Second Degree Murder. Cynthia Marie Sciortino was also arrested for 2 additional misdemeanor warrants to include LA RS 14:110.1 Jumping Bail and LA RS 14:40.3 Cyberstalking. Total bond is set at $1,109,000.00. Louisiana Attorney General Jeff Landry’s office has granted the West Carroll Sheriff’s Department vials of naloxone, a prescription medication that counteracts the effects of opioids to restore breathing during an overdose. The life-saving drugs were made available through a $1 million legal settlement between General Landry and Pfizer. Drug overdoses now surpass automobile accidents as the leading cause for injury-related death for Americans between the ages of 25 and 64. Louisiana is unfortunately one of the top ten states for these drug overdoses, with approximately 780 Louisiana residents dying from prescription overdoses each year. On the morning of September 13, 2018, investigators from the West Carroll Parish Sheriff’s Department and the Richland Parish Sheriff’s Department brought K-9’s to Forest School to sniff the school grounds for drugs. The K-9’s are trained and certified in the detection of various substances identified as controlled dangerous substances. The dogs checked lockers, backpacks, and vehicles at the school. A residual amount of marijuana and drug paraphernalia was found at the school. The West Carroll Sheriff’s Department, The West Carroll School Board, and Forest High School thank the deputies from Richland Parish who spent their day helping keep our communities safe. On the afternoon of September 11, 2018, agents with the North Louisiana Drug Enforcement Bureau (NLDEB) conducted street level drug enforcement across West Carroll Parish resulting in multiple arrests and the seizure of marijuana, ecstasy, morphine, and ambien. Two firearms were also seized. The NLDEB is comprised of agents from the Morehouse Sheriff’s Department and the West Carroll Sheriff’s Department. The task force occasionally patrols Morehouse and West Carroll Parishes in efforts to curb the trafficking of illegal drugs across both parishes. Crash reports made by the West Carroll Sheriff's Department can be ordered online at crashdocs.org. A fee of $10 will be required per report. Involved parties can pick up a copy of the crash report at the Sheriff's Office free of charge. 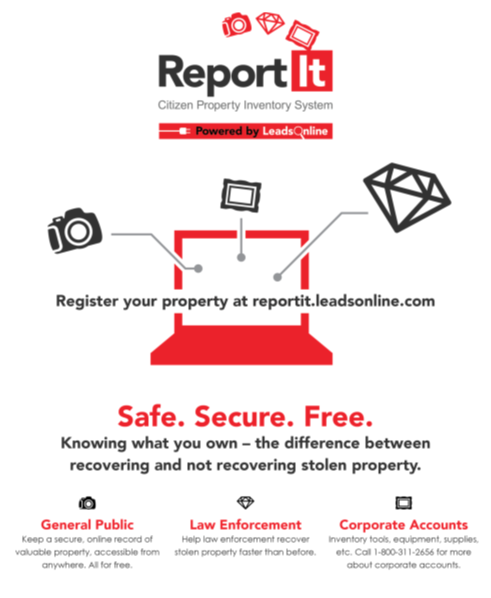 LeadsOnline Report It is a website that allows citizens to securely store serial numbers, item descriptions, pictures, and scans of receipts so that items may be more easily identified in the event of theft or loss. Knowing what you own can mean the difference between recovering and not recovering stolen property. In the event that your property is sold or pawned to a participating business, LeadsOnline will notify you and law enforcement. Sheriff Philley recommends everyone register their property so that, in case a theft or burglary does occur, your property can be more easily identified and recovered. To register, simply click on the link or the picture above and follow the directions provided.